Chocolate Gift Baskets Help Make the Perfect Girls’ Night In! Having a girls’ night in with your best friends is always a great time! Here are some great tips to plan the perfect girls’ night that all your friends will be raving about! Pamper Yourselves: Everyone loves some extra special treatment! Stock up on some face masks, nail polish, hair products and makeup so that you and your friends can give themselves that much needed TLC. Movies: From horror movies to rom-coms, pick a movie from each genre so that everyone can decide on the perfect movie to watch! Wine: This idea, of course, is only for those legal to drink! But the perfect Chardonnay or Champagne is a great idea for girls’ night in. Sip wine and feel glamorous as you gossip and primp yourselves. Food/Snacks: Perhaps the most necessary thing you need for the best girls’ night in is yummy munchies. It’s always best to go with salty and sweet but if you’re drinking wine, chocolate is the perfect pair! 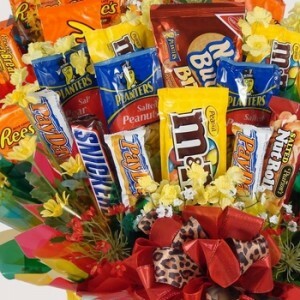 At Bisket Baskets, we offer a great Custom Candy Bouquet that you can stuff with all types of snacks and chips! This way, you can have a little of something so that everyone will find a snack they love! Your friends will love the big selection of full-sized chocolate and snacks and coo at the cute basket it arrives in. Order any of our delectable chocolate gift baskets today at BisketBaskets.com today! Celebrate National Wine Day Early with Bisket Baskets’ Wine Gift Baskets! 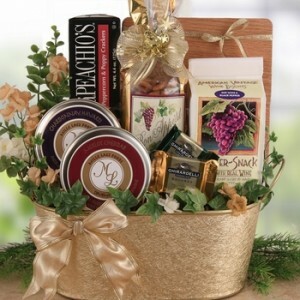 Refined Elegance Wine Themed Gift: This lavish basket is filled with Buttercrunch Popcorn, Sesame Crackers, Chocolate Wafer cookies, Wine Glace (makes the award winning Wine-a-rita! ), Amaretti Cookies, Wine Biscuits, Wine Vineyard Cheese Spreads, Caviar, and so much more! The wide selection is perfect for sampling! 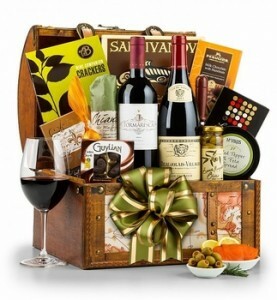 International Wine and Gourmet Chest: This gorgeous chest holds delicious treats for the more adventurous palate! Enjoy creamy Auberge Brie Cheese on some Aaron Bell Crackers topped with a mouth-watering slice of Chianti Wine Salami. Want an even more intense flavor to tickle your taste buds? Top the Saraivanov Smoked Salmon with some MT. Vikos Red Pepper and Feta Spread! These wine gift baskets also come with two selections of wine, Tomaresca Red Blend and Louis Jadot Beajolia-Villages Gamay! Nothing says wine appreciation like Bisket Baskets’ wine gift baskets! Order them today at BisketBaskets.com! Meal gift baskets are the ideal gift to give any time of year! Pizza Oven Gift: Everyone loves pizza and eating it after knowing you made it yourself is even better! This adorable meal gift basket includes a delicious Pizza Crust Mix, Mozzarella Cheese, Contadina Pizza Sauce, and Roasted Garlic Bread Spread. They will love the experience of making and more importantly, eating, their homemade pizza! Soups On! Gift Basket: Perfect for the chilly winter weather, our Soup Meal Gift Baskets are stuffed with delicious Roasted Corn Chowder soup, yummy drinks, and savory Wisconsin Cheddar Cheese! A Table in Tuscany: Pasta makes an awesome meal packed with carbs and flavored with mouthwatering tomatoes and garlic! Give the gift of an authentic Italian meal that will transport your gift recipient to Tuscany! Our Tuscany meal gift baskets all come with Authentic Traditional Marinara Sauce, Meatball Seasoning Blend, Penne Pasta, and tasty Buttercrunch popcorn for dessert! All of the dinners and snacks in our meal gift baskets are not only heavenly, they are easy to make! We provide the ingredients; all you need is your friends and family! 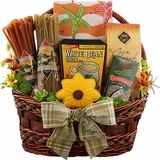 Order our meal gift baskets today at BisketBaskets.com. Bon appetite!